Tornado sirens went off at 3:30AM this morning … tornado north of us and tornado south of us. By the time I had made a spot in the basement for Kristine and the kids, it was pretty clear that the tornadoes were going to go around us — although the one that I rode out to today veered farther south than the original warning polygon had indicated. 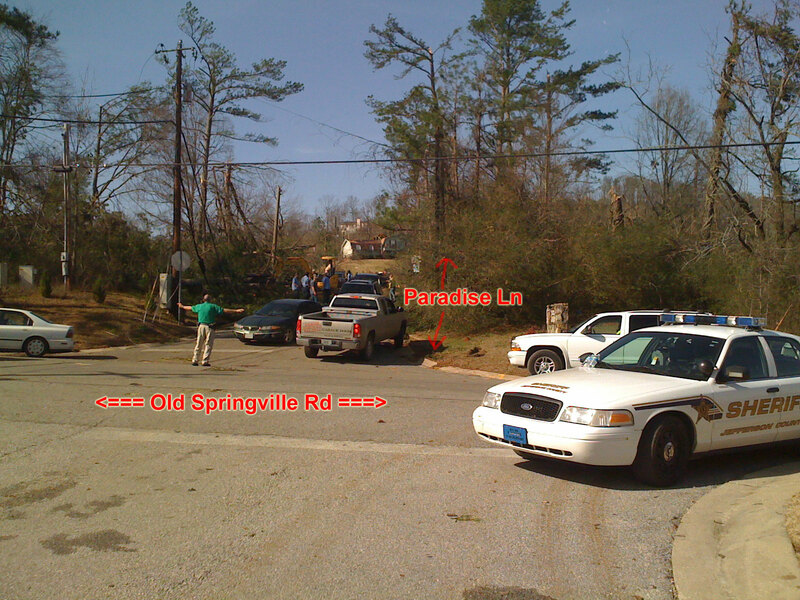 I was hoping that I could see the damage path from the ridges annotated in the map because I didn’t want to get in anyone’s way trying to help clean up … but there were too many houses and the valley where the tornado went through was too deep to see anything so I ended up cautiously just riding onto Old Springville Rd which was closed after asking a sheriff if I could make it through without bothering anyone. He said to watch out for the power lines and that it shouldn’t be a problem. Well, I was pretty much bunny hopping power lines for about 1/4 mile. 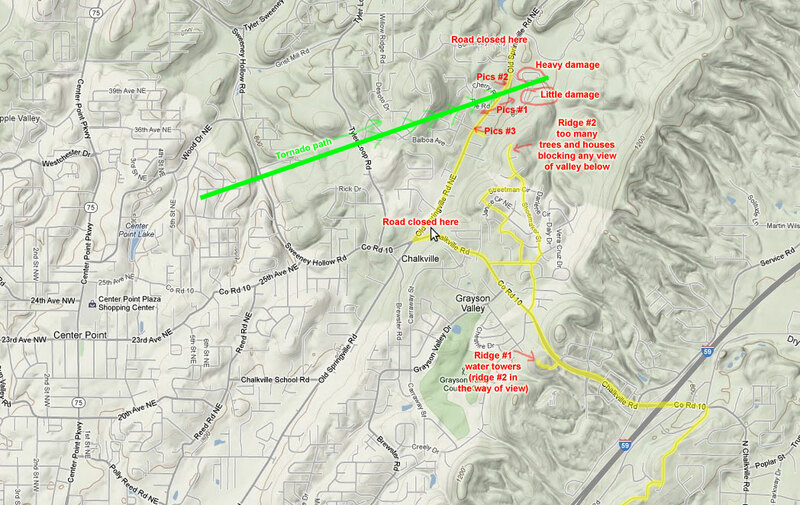 Here is an annotated map showing where I took pictures and my best guess at the tornado path based on the damage I could see on the ground … This is the tornado that went north of Birmingham passing through parts of Fultondale, Center Point, Chalkville, Clay. After looking at the streetview and satellite pictures, the damage is much worse than I had originally thought – the first houses have been pushed completely off their foundations. See the comparison photos below which are taken at slightly different angles which I tried to indicate as best as possible. 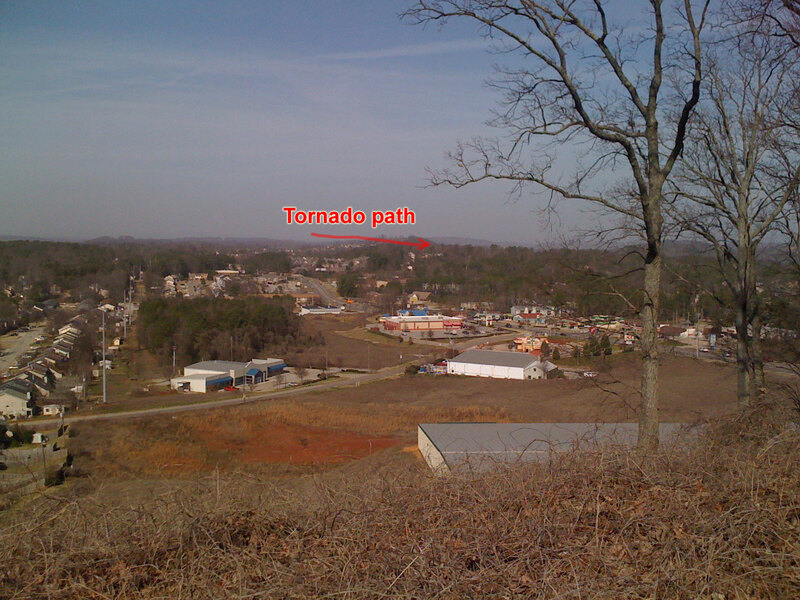 This entry was posted in Misc, Training and tagged tornado on January 23, 2012 by kartoone. 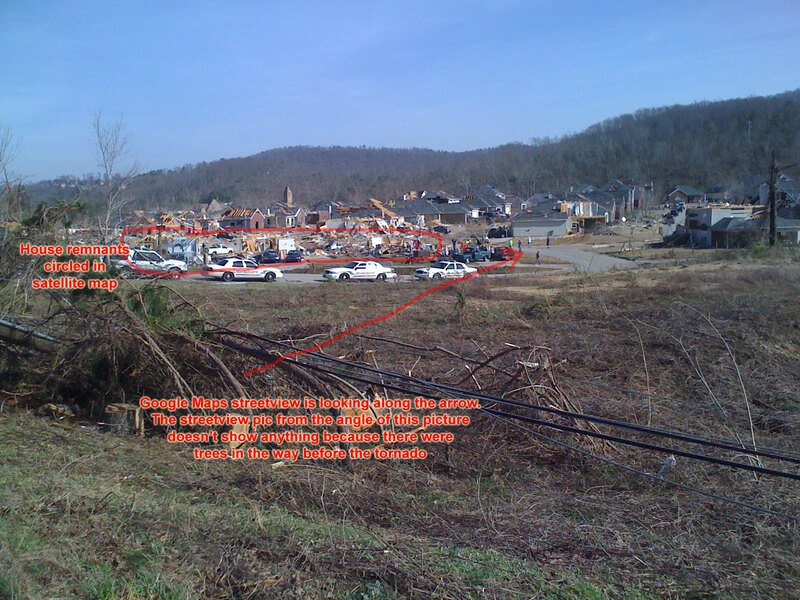 massive destruction….I am surprised law enforcement actually allowed you to ride through…..thanks for posting pics! If you’d continued up Old Springville until you reached Deerfoot Parkway and then headed back towards Trussville, you’d have seen more tomado damage down in that direction. I think Deerfoot Parkway is open to through traffic now, although some of the affected neighborhoods off the Parkway were still closed to non-residents, at least as of last night. Thanks for the update – it’s just really sad how sudden and devastating a tornado can be. Especially when one house is completely destroyed and the house next to it only has minor damage.